View of The Lanterns, Candlestick & Cape Hauy from Eagles Lookout. 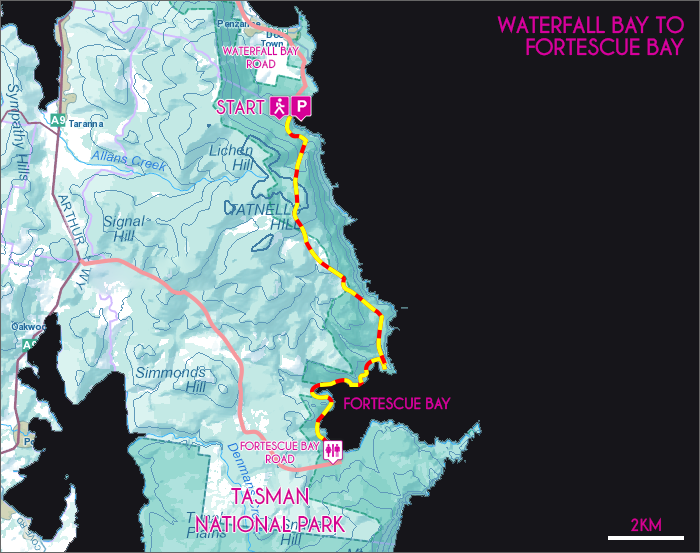 Noted for encompassing some of the most stunning coastline in Tasmania, the Waterfall Bay to Fortescue Bay trail constantly astonishes hikers with its exquisite views and ever changing forest scenery. Spread over 16km of picturesque coastline this trail is a solid 7 hours one-way hike. Drop off or pick up transportation must be arranged. Don’t let logistics put you off; the effort in planning this walk is exponentially rewarded by the spectacular nature of the trail. This walk is nothing short of amazing. View Google Map Directions From Hobart head over the Tasman Bridge and continue on the Arthurs Highway (A9), turning right at the main intersection in Sorell (sign for Tasmanian Peninsula). At Pirates Bay, 50km from Sorell, turn left onto Blowhole Road, continuing for 2km before turning right onto Waterfall Bay Road. The car park is at the end of the 4km gravel section. Note this is a one way trail and a car will need to be left at Fortescue Bay. Continue towards Port Arthur, taking the first left after the Tasmanian Devil Park, onto Fortescue Bay Road. This 12km gravel road leads to the Fortescue Bay camping area where the walk ends. Nestled in the contours of the towering cliff lines of the peninsula, the view from our starting point Waterfall Bay is spectacular. Directly across from the trailhead a waterfall plunges into the sea from 200m up. 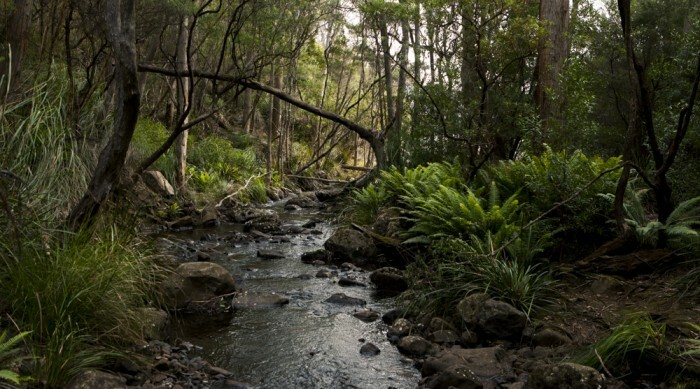 The walk begins with a gentle climb up along the inland section of Waterfall Bay’s cliffs, climbing through dense Stringybark forest for 20 minutes before reaching the Camp Falls picnic area. Along the way you are presented with many opportunities stop and take in the view back towards Tasman Arch and Eaglehawk Neck. From the Camp Falls a short return side-track continues to the Waterfall Bluff which looks back towards Eaglehawk Neck from a high plateau. 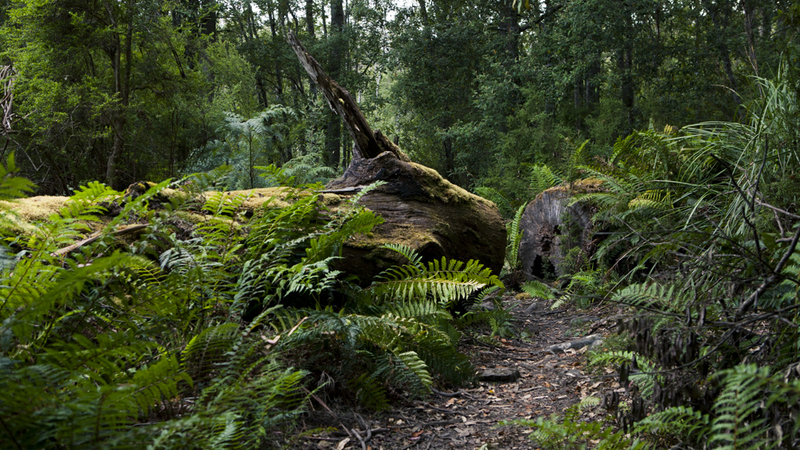 Once at Camp Falls, the track continues up the left bank of the creek and enters a beautiful rainforest embankment. For the next 45 minutes the trail climbs through the steepest section of the walk to the highest point of the walk, Tatnells Hill (548m). From here the climbing subsides and the trail gently winds downhill for quite some time. Occasionally the trail skirts extremely close to the edge of the cliff, providing breathtaking and heart racing opportunities to soak up the tremendous views of the coast including Cape Hauy and Tasman Island. For the next hour the trail continues to follow the cliff line downhill, passing multiple vantage points all equally as impressive their previous counterparts before meeting the water just before Bivouac Bay. Stepping across the creek into Bivouac Bay is fantastic, this area is easily one of the most picturesque resting spots along the peninsula and makes for a great introductory overnight hike from Fortescue bay. Toilet facilities are available on the coast side of the camp grounds. Continuing on, the trail follows the coast and gently climbs over the ridge line between Bivouac and Canoe Bay. The trail here is lush with thick Blue Gum canopies and you can’t help but be taken in their beauty. As you enter Canoe bay the trail crosses Walker Creek via a suspension bridge. Towards the middle of the bay The William Pitt, sunken in 1970, can be seen roughed up against the rocks. The trail gentle winds along the coast for another hour before reaching the far end of Fortescue Bay Beach. 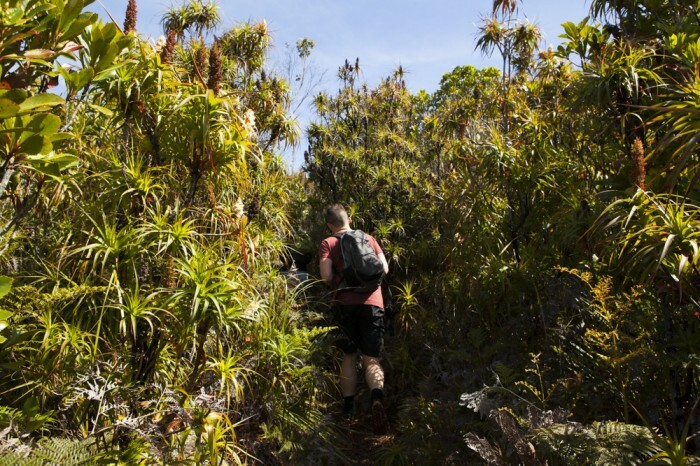 Through the entirety of this walk the views and immediate surroundings are stunning and make the 7 hours hiking time seem to fly. There are steep cliffs between Waterfall Bay and Fortescue Bay, take care when approaching the edge.